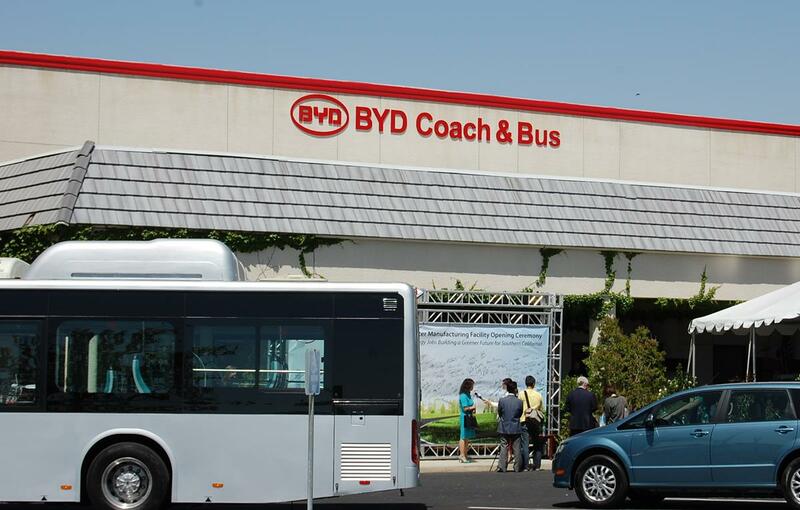 BYD Coach and Bus is located at the former Rexhall Industries at 46147 BYD Boulevard (previously 7th Street West). The California Department of Industrial Relations’ Division of Labor Standards Enforcement has cited and fined Chinese electric vehicle manufacturing company BYD (Build Your Dreams) nearly $100,000 for failing to provide minimum wage, workers’ compensation insurance, a second rest break, and sufficient documentation of pay, for workers in Los Angeles. According to the New York Times, Chinese-national workers were working for BYD in Los Angeles for up to six months, living in dormitory-style housing in the San Gabriel Valley, and earning just $1.50 an hour plus a $50-per-day allowance. According to the Los Angeles Times, BYD was fined $79,250 and ordered to pay nearly $20,000 in back wages for violations involving 22 employees, including some employees at BYD’s Lancaster, California factory. Other recent news stories have also called BYD into question for failing to pass federal safety testing for their electric buses, currently being produced for contracts with the Los Angeles Metropolitan Transportation Authority and Long Beach Public Transportation Authority. 36 comments for "BYD fined for paying workers $1.50/hour"
I live in Quartz Hill near where the original QH airport once was. Last night my husband and I were driving down our street and two cars with nicely dressed (suits/ties) Chinese men were unloading and they were then either going into the house they were at or getting in other cars to leave. There were at least 6 cars in drive. At $1.50 hour wages, I guess it takes a village to pay the rent. Sum ting wong here… L Lex Pallis good man! Looks like it is high time to crank up them birdie sounds on the BLVD. It has been a rough couple weeks for Rex. Birth tourism— BYD wage—BYD safety issues—paying out on the Allied Arts lawsuit —getting smacked down on the power plant—saying there’s no good restaurants— having a major newspaper call him eccentric and that many consider him crazy—getting smacked in court in his lawsuit on voting— ouch! Not happy times in Rexville. What to do? Let’s sing! If you’re happy and you know it clap your hands! CLAP! CLAP! If your’re happy and you know it clap your hands! CLAP! CLAP! If you’re happy and you know it then your hands will surely show it, If you’re happy and you know it clap your hands. CLAP! CLAP! $1.50? That only tells me this company illegally brings in people out here! That’s probably why they want to be out here in the AV! So much land an not to mention birth facility’s! $1.50/hr wage+ $50/day allowance ($6.25/hr over 160 hrs/mo.) + $6.25/day for board (figured @ $500/mo. rent) = $14.00/hr or $2240/mo. including pay and pay in kind. Just doing the math folks. $1.50/hr wage+ $50/day allowance ($6.25/hr over 160 hrs/mo.) + $3.75/day for board (figured @ $500/mo. rent) = $8.22/hr or $1315.20/mo. including pay and pay in kind. Had to re-calculate. What will happen next for our Rex? I’m guessing locusts will land in Lancaster. I’ve also seen posts from people that interviewed for BYD in a job search group. I had never before heard of a company that wanted the prospective employee to travel to a different company for training, at their own expense before hiring them for the job. My friend William told me this BYD was good for the Valley and would bring in lots of jobs, he was wrong again, he believed all the lies from Rex. I knew better, don’t believe any of the democrats like Rex and Obama, they all seem to lie. He (Parris) is Republican, but thanks for playing. He IS a politician, which I believe has lying as a job requirement, so at least you got that part right. Well I’m not surprised one iota! I questioned a long time ago were workers hired by BYD going to American citizens or??? I guess my questioned got answered! I was NOT supportive of this company coming to the AV, that’s for sure! I’m also sick of all this $$$ going to the BLVD. That place is a hot mess. How about all the other streets in Lancaster? How about finding another reasonably priced building for KMART to relocate to? ANOTNER business loss for Lancaster! I shop at KMART a lot! And all those jobs going bye-bye! I’m disgusted! Rex is no republican, he’s a freakin’ RINO like NJ Gov Chris Christie. And if you think wih the private prison converting to a state leased facility in Cal City isn’t going to attract more crap bag families, think again! This Valley is going to poop! Nice if BYD was courted out to the AV to bring jobs to the community, however, I’m interested to know how many employees are at the Lancaster plant and how many of those employees are US Citizens! I catch a lot of flak for mocking the BLVD, so I loved that you called it a ‘hot mess’. It’s not my imagination then. See, Adam Chant. Lots of folks can see what the BLVD is without rose colored glasses. I stopped by the Antelope Valley Mall today. It was so clean and nice inside with pleasant smells from the various food outlets. Even the men’s restroom, usually not the nicest place in any town, was spotless. Don’t they have porta-potties or something on the BLVD? I’ve heard horror stories about the restrooms at BeX, Parris’s pride and joy. And, some of them were from reviews on Yelp. Yikes!!! How can a business leave such things uncorrected…….immediately? It’s one thing after another with Rex and his grand world class designs for Lancaster. Make that 3rd world. You know. I know. We all know that Rex will split from Lancaster when he’s done with his bright ideas. I’m shocked!!! SHOCKED I tell ya. There’s the questionable new law offices in the old McMahon building in a redeveopment zone. Plus, who knows what deals were made behind the scenes for the BLVD. Has Parris ever done anything with complete integrity in his life? I wonder what contortions he puts his accountants through on tax day. Is he another Mittens Romney when it comes to paying taxes. He’s bad enough within the confines of Lancaster before we even discuss his destructive moves on Palmdale and Quartz Hill. William, let me tell you the facts of life regarding Rex and doing business in Lancaster……oh wait, you’ve already figured them out! Thank you. But it was nothing. A blind person could see what kind of person Rex is. When you look at what he’s said and done publicly, can you imagine what he does behind closed doors? Stuff we haven’t found out about………….yet. Did you think that Rex would actually work with a reputable company that holds to the highest of possible standards? Birds of a feather……I agree. When will the citizens of Lancaster awaken from their LBC induced slumber??? Oh well, we’ll always have the BOOlvd. I’ll go you one better and I think you’ll like it. He brags about how fast a business can get approved and licensed in Lancaster while apparently not bothering to look into the background of the company such as BYD. Sure, you can fast-track anything if you aren’t diligent. The only thing Parris is diligent on is butting in to Palmdale’s business while his own city suffers from his ignorance and braggadocio. He has both in abundance. They should put a electricity producing wind-turbine in front of Parris whenever he’s talking. It’s worth finding out if this issue even occurred here before tossing anyone under the proverbial electric bus. There is no doubt BYD is 100% guilty for how they compensated these people, but even posting this story in the first place as if it was a “Lancaster story” seems a little sensationalistic on the part of AV Times. No one is going to be shopping at our malls or eating at our restaurants if they are living under those conditions. They will see how Lancaster BYD does it and will follow suit. See easy to go cheap! Now, there’s got to be a way that Palmdale can be blamed for this…..
No, Dumb Lancaster is on it’s own! Lancaster thinks too highly of it’s self! Obviously something got lost in translation when Rex went to China !! Ha ha., and were they making babies ( u.s.citizens)in those dormitories ? All this trouble for mayor parris’idea of an economy boost and these plants pose no health or environmental concerns? 100 million for Mira loma womens facility? 19 mill for the eye in the sky? When will people wake the hell up? The city of bell ain’t got nothing on mayor parris! This is corruption at its root and he gets away with it! WAKE THE HELL UP!!!! I wonder what Rex pays his workers at his law firm? I’m just saying. Somehow this does not surprise me. China owns most of our country, so this could be the future for American workers !